Southampton NHS General Hospital’s new piazza forms part of a significant redevelopment to provide enhanced modern healthcare facilities for the city. Under the scheme, Southampton University Hospitals Trust is building a new £53 million cardiac ward to be known as the North Wing. Due to the proposed development, land was released for the facility and proposed future buildings. This meant much of the existing roads, footpaths and the hospital’s garden area needed to be reworked to facilitate a smooth transition around the developing site. In the planning stage, the trust realised the importance a garden area brings to the hospital and its users, and not wanting to lose this essential space, assigned a new plot adjacent to the main entrance. The landscaping division of architects RPS was commissioned to develop the site with the challenge of creating a flexible, peaceful space, able to accommodate a range of needs within a vastly reduced area. Driven by the principal design lines of the new buildings, existing car park, pedestrian and disabled access to the main reception, RPS proposed an innovative new urban piazza that responded to the architecture of the new cardiac facility and the future extension of the cancer sciences block, the Sommers Building. 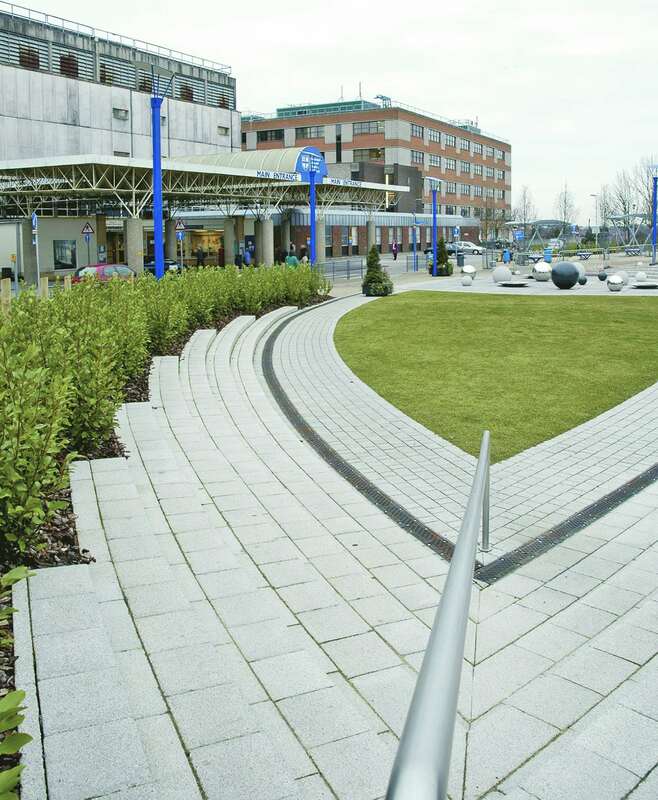 The creation of the new ‘teardrop’ shaped piazza incorporated a series of south facing curved steps with level access in front of the main hospital entrance. 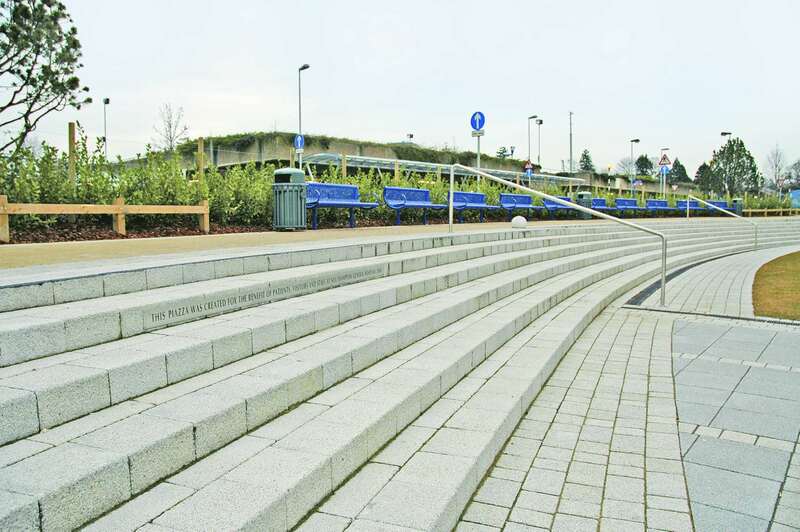 As well as framing the lower grass and paved area, the steps provided additional seating in what is expected to be a heavily used space. 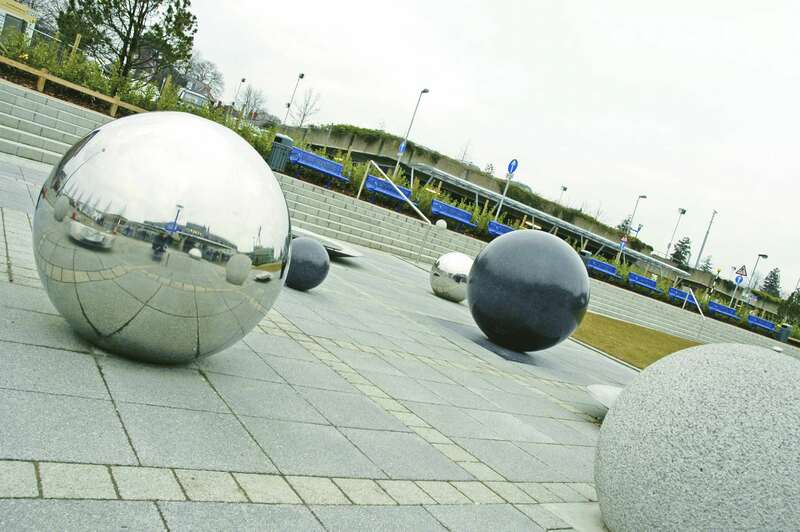 The shape also helped form the focal point of the piazza where a visually exciting range of different sized stainless steel, stone aggregate and acrylic spheres are positioned allowing pedestrians to walk through and interact with the various globes. This was all sited on a rigid square grid with dramatic lighting and textures to create a unique and visually stimulating impact. To enhance the piazza, bold shrub planting, evergreen hedges and clipped trees in the form of boxes reinforced the geometry of the paths, to create a secluded space where people could come and relax away from the hustle of hospital life, to ease stress, help aid recovery, and give people an enjoyable tranquil space. 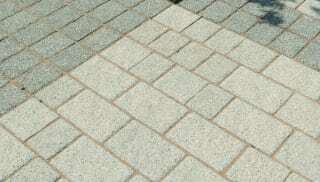 Following strict budgetary guidelines, RPS already had a strong relationship and knowledge of Marshalls and its products, and was confident the company could provide a quality, value, single-source solution. 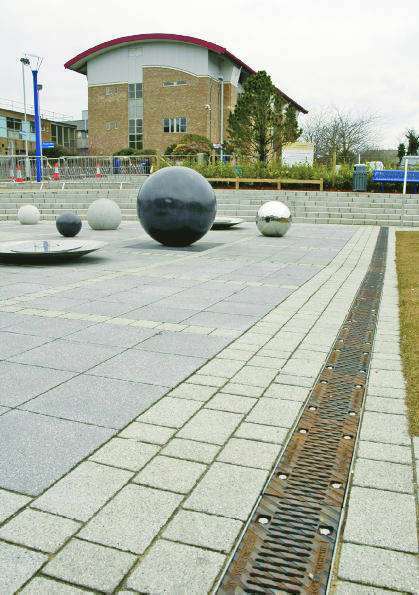 Choosing from Marshalls’ proven concrete block paving (CBP) and paving ranges, the architect blended a palette of products and colours to create a distinctive design that offered a sustainable long-life solution through the resilience and robustness of the material specified. 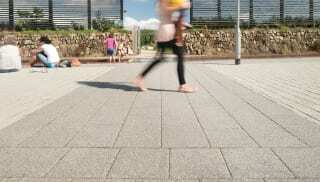 In the heavily-trafficked spaces Tescina CBP was used, giving sure-footed performance in all weathers through its enhanced surface texture and high resistance to wear. 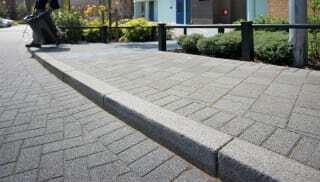 In other areas Mistral setts and Conservation paving and kerb added architectural and aesthetic refinery, denoting the modern aspirations of the hospital, for its forthcoming structures, supported by life-long functionality. Since the piazza opened it has already become an integral part of the hospital. The blend of materials has helped to create the architect’s vision of a space that eases the issues of the day. Visiting families and friends chatter with loved ones. Staff enjoy their lunch and quietly relax, away from their busy schedules. Patients come to enjoy the fresh air, outside the confines of their wards, all interlaced with the undisruptive flutter of people who enter and then exit the piazza efficiently, true to its creator’s design.